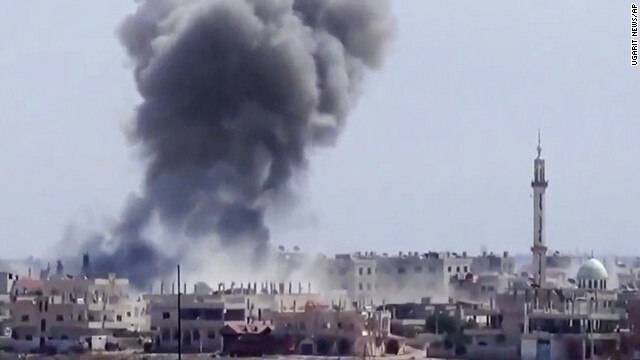 "There is a very real possibility that extremists in the Syrian opposition could overrun and exploit chemical and biological weapons storage facilities before all of these materials are removed," he said. Flynn and Director of National Intelligence James Clapper testified on the worldwide threat situation before the Senate Armed Services Committee. While calling the humanitarian situation in Syria an "apocalyptic disaster," Clapper said the estimated 7,500 foreign fighters in Syria, from as many as 50 countries, pose a significant security challenge. "Among them are a small group al Qaida veterans (from Afghanistan and Pakistan) who have aspirations for external attack in Europe, if not the homeland itself." And with the de-centralization of command within the al Qaeda structure, both officials offered sobering assessments of whether the organization was on a path to defeat. "No, it is morphing and franchising itself and not only (in North Africa), but other parts of the world," Clapper said. "They are not," Flynn added. With ongoing support from Russia, Iran and its proxy, Hezbollah, to Syrian President Bashar al-Assad, and a splintered opposition movement, Clapper cautioned against any optimism for a near-term negotiated solution. "I think what we are facing right now is kind of a prolonged stalemate." There was also bipartisan rancor directed at the President Hamid Karzai of Afghanistan for stalling on a bilateral security agreement with the United States along with a host of other security related issues. "It's my own view, not necessarily company policy, is I don't believe President Karzai is going to sign," the agreement that would allow for a small number of U.S. forces to remain in the country beyond the current NATO mandate Clapper said. "President Karzai, in my view, is singlehandedly destroying this relationship," Republican Sen. Lindsey Graham of South Carolina said of a decision by the Afghan government to release dozens of prisoners believed to be involved in terrorism. "Actions like this make it very hard for an American politician to do business as usual in Afghanistan," he said. Both Clapper and Flynn continued to stress the damage done to the intelligence community by former NSA contractor Edward Snowden whose leaks they contend have opened a window to terrorist organizations. "We're beginning to see changes in the communications behavior of adversaries, particularly terrorists," Clapper said, while assessing Snowden had accessed over 1.7 million intelligence related documents. "A disturbing trend which I anticipate will continue." "I have no doubt that [Snowden] has placed the men and women of our armed services at risk, and that his disclosures will cost lives on our future battlefields," Flynn said. What a mess this whole region turn into . Come to think of it,it was being held together by a murderous dictator the whole time .this is exactly what you would expect to happen. They really nailed this assessment this entire region Is completely messed up. I don't know what the solution is going to end up being but hopefully we can get through without dragging us into a deeper war . The leaks of mr. Snowden may have done some damage in the short run, yes. From a middle- and long-term perspective, I believe he has done the American people – and the world – a tremendous service. He has shown how wrong things can go if you let the intelligence community go ahead without any criticism. How people can be made a suspect, without ever having to do something to justify that. By changing the ways of the intelligence community, under pressure of public outrage, the moral standard of the US can become more credible and gain more support around the world. I don't think the NSA leak has caused any significant damage that is more important than our own privacy in our own homes within American territory. The real threat is misinformation that has blocked any further advancement of the free Syrian Army. Where is the news coverage of their latest political triumphs against Assad? The last I heard was that they had defected government officials in Europe. Do they plan on returning to lead the free Syrian Army? That sounds like the right next step. We have our personal lives and sometimes even though we wish the best for everyone across the world, sometimes we have to worry about personal obstacles at home. Thanks to God I myself have succeeded past my obstacles. I wish the same for the free Syrian Army. We are found in my a better position, especially after killing two flies with the same stone, the corrupted American government and the NSA official that leaked information, BOTH. It is upsetting to see the smooth talking, two faced,Mr William Hague,the UK foreign minister, in Christian Amanpore's interview tonight. I take distance from UK's lack of action in perilous situations such as Kongo and Syria. He blames EU for lack of action in balkan, while in fact the UK have become an introvert, selfish and smooth talking coward nation, seeking to become an obscure little island in the North Sea apart from the EU, and forces in EU take action. We've known all this the whole time. Our government isn't surprised about anything. They know it's going to happen when they do what they do. Israel is the biggest terrorist nation in the Middle East. You actually need to worry about all of north africa, most of the middle east. Focusing on places where embassies blow up. That is usually the first step they take. Disable / impair communication channels so the targeted killing to catalyze a civil war is more effective. Strong communication and intel gathering during this phase can potentially counter their momentum. Prove who is doing the killing in the beginning and it will catalyze an anti islamic movement. You need to expose what I am saying and make it public the people directing the jihad are ordering the slaughter of their own people to catalyze it. Egypt, Syria, Iraq, Uganda, in no particular order. This is only the beginning too. It wont be long before countries like the uk end up on that list. They are taking the soft targets first. When this is finished it will be substantially more difficult to stop. ALso looks like south america is about to the riot stage. Just enough confusion to catalyze another rebellion. So Glad Obama's foreign policy is working..... I heard Iran just tested an A-Bomb! afaik their test would have been a year ago around christmas , in NK. They just tested a long range missile delivery system. It just might be better to negotiate with the ISIS and let them carve out a part of eastern Syria along with western Iraq and let them set up their own home state. In return, we ask them not to attack either western Syria and eastern Iraq. This alone could go a very long way in bringing peace to that area. Unfortunately, most people are just to ignorant to see it and the bloodshed will continue. YOu sure do enjoy parting up other peoples countries to appease a bunch of murderers. Hopefully assad wipes them out. It is a buildup, the calm before the storm if you will. I completely agree with their assessment except for the part where they treat AQ as the threat. AQ is effectively a symbol, the way you are fighting, and approaching this is identical to an enemy thinking attacking or destroying the Army, or Marines would destroy the US. Look at it more like piracy. Going after boats full of pirates won't fix anything. They can evade you enough that a new crew forms before you can take one out of commission. I think this fundamental flaw in our approach is going to cost us. While we effectively chase the success of the Islamic jihad , we do nothing to stop the driving momentum. AQ is simply one 'brigade' of an islamic army that is slowly toppling governments all over the world. It is a hashtag. Not an organization. Groups and people are admonished and invited and condoned. It is a facade that as long as we allow it to distract us we can't win. The problem is Im fairly confident it is the countries we are funding , the same one that gave us binladen, that are behind it. Our politicians are in their pocket. This is why any attempt to curb oil consumption is quashed. This is likely being directed by our allies, and our own politicians on some level. When terrorists/jihadi's do stupid stuff, like blow up an entire class of would be suicide bombers and instructor, then its ISIS or the outcasts that do it. If its a SUPER effective attack then it is AQ or what ever else. It is effectively a way to magnify minor successes into an organization or symbol so it has greater effect.